I didn't plan on reading this book (and the thematically related Eve: A Novel of the First Woman and its sequel). And his erudition is astounding. You may not accept his interpretations of Greek myth (The Greek Myths) or of the pre-Indo-European goddess cults (The White Goddess: A Historical Grammar of Poetic Myth) but you have to grant him a mastery of the sources common and obscure that few can equal. In King Jesus Graves exploits every contradiction in the canonical Gospels, the Apocrypha, Jewish tradition and Gnostic writings and combines it with pre-Hellenic religious traditions to write the "real story" of Jesus' ministry. 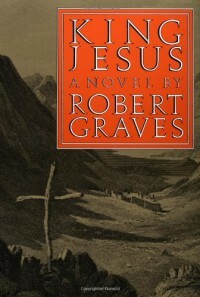 Graves makes no concession to later Christian mythology. Jesus believes he is a Jewish Messiah sent to "destroy the works of the Female" (more of that later). Other nations may be saved but it would be under the hegemony of a Jewish savior of a restored Israel. The book purports to be written by Agabus the Decapolitan during the reign of Domitian (AD 81-96); a pagan who once succored a follower of Jesus during one of the persecutions. This source vouchsafed to Agabus the real story because he believed himself to be the last survivor and wanted to preserve the true tradition of who Jesus was and why he acted as he did. I don't know if Agabus is a historical figure; knowing Graves' exhaustive research into obscure texts, he may very well be but he's a believable narrator for the story: disinterested but sympathetic. Graves also makes it a point to relate the story through the eyes of a first century AD, educated citizen of the Roman Empire. Agabus is not an atheist or skeptic, he worships his gods and accepts that Jesus could, for example, raise a man from the dead by uttering God's true name or heal people based on his own strong faith and the faith of his followers. The first part of the book recounts the birth of Mary, her life and Jesus' birth. It would be too confusing to recount all the background but suffice it to say that Mary is the scion of the matrilineal line of high priestesses displaced by the patriarchal worshipers of the Sky Father who overran the Middle East and among whom are the ancestors of the Jews. This displacement was not total, however. For millennia, the invading patriarchs have had to win legitimacy by marrying the priestesses and honoring the goddess (in her many manifestations). This is where Christians may get "nervous": In order to legitimize the Herodian dynasty, the Jewish High Priest of the time (Simon) concocts a scheme whereby Herod's first son, Antipater, weds Mary and their issue will reign as a king acceptable to the entire Jewish nation. The first half of the plan goes well: Mary and Antipater are secretly married and he manages to get her pregnant with Jesus. Publicly, Mary is wed to the septegenarian Joseph of Emmaus. After this, alas, things fall apart. Antipater is not the most politically savvy operator and falls afoul of his father's raging paranoia, forcing Joseph, Mary and Jesus to flee to Egypt. Denied political power, Jesus comes to see his Messiahship in a far more symbolic and important light: Rising beyond the flesh (the Female) and bringing an era of spiritual enlightenment that will free men and women from carnality and the snares of the flesh. Women aren't to be excluded from the Kingdom but they and men can only enter by denying the flesh - becoming neither male nor female. In reference to the Yahweh cult's accomodations with goddesses, there is a growing body of archeological evidence confirming it. The God of the Jews and the New Testament we're familiar with - alone, transcendant, omnipotent, etc. - wasn't created until the Deuteronomic reforms of King Josiah in the 7th century BC (The Bible Unearthed: Archaeology's New Vision of Ancient Israel and the Origin of Its Sacred Texts). Hopefully, this barebones account of this remarkable book will encourage readers to check it out. Beyond its provocative subject matter, it's a good novel in its own right. And I'll take this opportunity to highly recommend Paula Frederickson's Jesus of Nazareth King of the Jews: A Jewish Life and the Emergence of Christianity. It's a nonfictional perspective on "the greatest story ever told" that tries to make sense of Jesus' life in the context of 1st century Palestine and does so in a very persuasive argument.